European Sociological Association, Communications and Media Research Network Conference, Athens, 29-30 October 2010. This paper attempts to offer a methodological contribution to media production research. By reconsidering an earlier case study, and reviewing relevant literature, it illustrates how humour can fulfill several functions in media production. Importantly, humour is a central means of performing the ‘emotional labour’ that increasingly precarious media work demands. Methodologically, the everyday joking and banter of media workers can provide an important and, heretofore, overlooked means of accessing culture, meaning, consensus and conflict in media organisations. 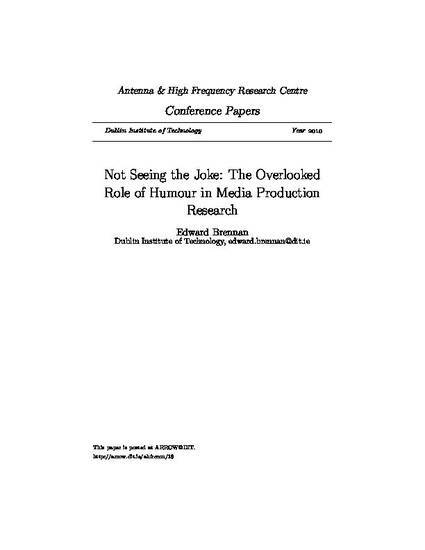 The article argues that humour’s organisational role should be considered when designing production research. Brennan, E. 2010. Not Seeing the Joke: The Overlooked Role of Humour in Media Production Research. Conference Paper: European Sociological Association, Communications and Media Research Network Conference. Athens. 30 October 2010.